Get started with financial customer journeys. Learn how to get started with a customer journey strategy that connects marketing with sales and service. 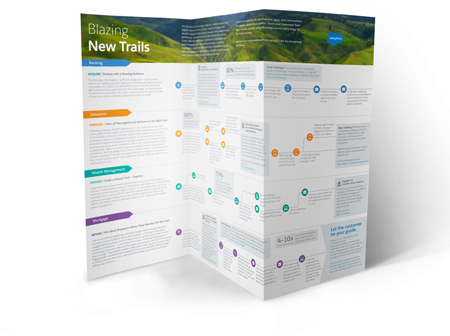 See four sample financial services journeys and use cases in the Journey Builder Trail Guide. You’ve heard a lot of talk about “the customer journey:” the series of consumer interactions that collectively define your 1-to-1 customer relationships. 73% of top marketers say customer journeys improve engagement — so a journey strategy is crucial. But the way ahead can seem daunting and unclear.